The Rolex stainless Date or DateJust Quickset model is a staple in the Rolex line. 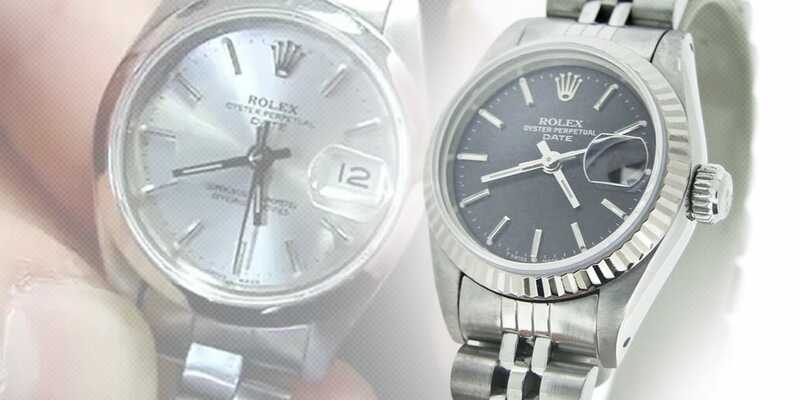 The all stainless model shares the same profile, wearability, and provenance of all the other Rolex timepieces. This video will show how to wind the watch and set the time and date on this touchstone timepiece. This is a ladies stainless steel Date or DateJust reference number 69160. This is the Quickset model. We’re going to tell you how to wind and set the date of this beautiful timepiece. Right now it is in the wearing position. Notice that the crown is screwed in all the way. What we’re going to want to do is wind the watch. This is done if the watch has not been worn for longer than, maybe, a day, or day-and-a-half, or if you just received the watch. This is to insure that the movement will be fully charged and it will keep time accurately. First what we are going to do is gently unscrew the crown counterclockwise to where it unthreads, and comes loose from the case. The next, we’re going to in a clockwise motion wind it approximately 20-40 times. Next what we are going to do is we’re going to set the date. We’re going to pull the crown out gently one notch and we are going to move it to the 12 as today is the 12th. Now we are going to set the time. Gently pull the crown all the way out to its last position. Now we’re going to move the hour hand as it is 10:28. And now, we’re going to screw back in the crown by pushing in and turning up. Now, notice the second hand is moving. And now it is ready to be worn and enjoyed.